Merely 4 years ago I wrote a blog New SCN for Old Folks about the aftermath of migration from SDN (the one with the “D”) to SCN. I guess just like death, taxes, and SAP upgrades (2 blog plugs in one paragraph, booya! ), the SCN migrations are also inevitable. So here we are again, on SCN 3.0, just a week after moving in, standing in the middle of a living room wondering where is a TV remote and nervously checking what was smashed by the movers. When I was little, my mom, the professional career woman, would sometimes get a sudden urge to clean up our apartment. This noble intention usually resulted in her taking stuff off the shelves and out of the closets and piling it up in the middle of a room. After that she would feel tired and leave for a cup of coffee with the friends. The Stuff Mountain would then sit there for a while, until my dad, sister, and I slowly put everything back where it came from. Or if the guests were coming everything would just be frantically stuffed into any available space. This reminds me of what happened with SCN. And now we just need to put stuff away and move on with our lives. How do we do that? I’ve naively expected there would be some big link with FAQs on the front page to help the existing SCN members with the transition. But there doesn’t seem to be anything like that and “Getting started” section doesn’t help much to those who are rather continuing than starting on SCN. So below is my attempt at some SCN change management with random SCN 3.0 FAQs and tips from a twice SCN migration survivor. 1. Where are my SCN points? “…aaaaand it’s gone!” Sorry, all your hard-earned (I hope) points are gone (but not forgotten – see comment from Steffi Warnecke below) and there are no more points or precious stones or free dog tags and t-shirts (oh, the memories). If this was your only motivation to participate in SCN then it was nice knowing you, buh-bye. Otherwise stick around and simply enjoy the ride. 2. Where are my SCN badges? All the badges you had on SCN (called “legacy badges” now) are proudly displayed in your profile in Reputation section. Some new missions and badges may be coming soon. 3. Where is my profile? Previously, we could access our profile just by clicking on the picture (avatar). Now we still need to click on the picture in the top right corner. But this just opens a drop-down menu where we need to click on our name to actually get to the profile. I found that you can also get to your profile by simply using URL Former Member with the exception of some items that were deleted (e.g. questions with no replies). They are no longer accessible through your Former Member (look for Excel download link). The links in the Excel file will take you to a “tag page” where you’ll see blogs and questions with a primitive filter. 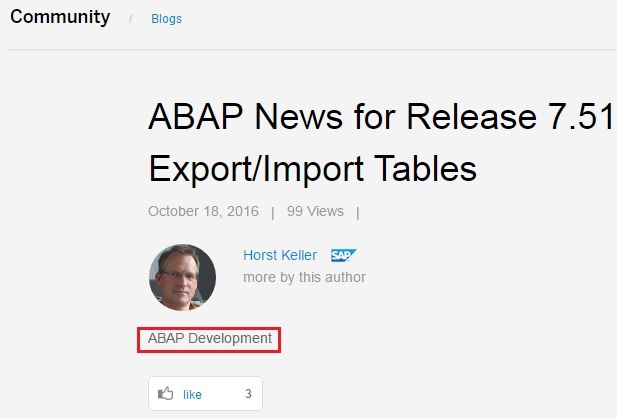 Then in that blog or question, click on the tag (in the screenshot above it’s “ABAP Development”). This will take you to a list of all the blogs or questions (depending on your starting point) with that tag. You can bookmark the resulting page. Another trick is to post a question using the tag of interest, then navigate to the tag as described above, bookmark the tag page and then delete the question. 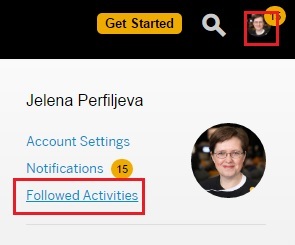 You can use “Follow” button on those pages (as well as on the individual blogs or questions) and this will make the corresponding activity appear in your Activity Stream. But as it is, the activity is rather unmanageable, so I prefer just visiting the pages periodically. Keeping fingers crossed for some improvements in this area. 7. How do I ask a question? Always search before posting a new question! This rule still applies and I can’t stress this enough. After that, scroll past that list (it could become more useful at some point in future, perhaps in Service Pack 33? ), enter your question, select a language (I recommend English) and choose a primary tag. When you start typing, the candidates will be proposed, but you can see it’s just about as helpful as “search ahead” in the first field. 8. How do I answer a question? And what is the deal with “comments” and “answers”? You found a question? Great job so far! Now the question to ask yourself is: do you want to provide an answer or do you just want to add a comment? For example, consider a question “What is SAP? Please explain step-by-step with screenshots”. To this something like “It is a device whose mystery is only exceeded by its power” would be an answer. And “Hm, looks like someone has been banned on Google…” would be a comment. Of course, Alert Moderator button is really what should be clicked in such case but I’m just making a point here. Anyway, back to comments and answers. What are the consequences of this choice? The comments cannot be up- or down-voted, they can be only “Liked”. The comments are displayed on top, before the answers. They cannot be sorted together with the answers. Answers can be up- or down-voted by others (affecting your SCN street cred, I guess – there are no more points, remember?). Answers can be sorted by votes or chronologically, just like the replies on SCN 2.0. Only one answer can be accepted by OP, which is the equivalent of the old “correct answer”. 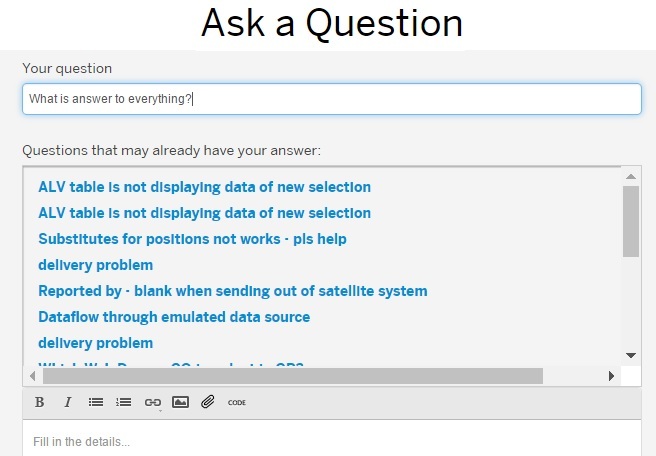 There is no more “helpful answer” concept, but you can up-vote (by clicking the top/down arrows) as many answers as you like. Word of wisdom: just like with the questions, try not to create redundancies here. If an answer has already been provided, don’t add another one with the same information. If you only have something minor to add, you can simply comment on the answer. 9. How do I search on SCN? IMHO even the temporarily confused Google search still beats the SCN search. But if you insist. It may seem logical that to search SCN you’d just click the search (looking glass) button in the top right corner. But this is SAP we are talking about, silly, hence this button actually leads to some generic search in the whole sap.com domain, not to SCN search. 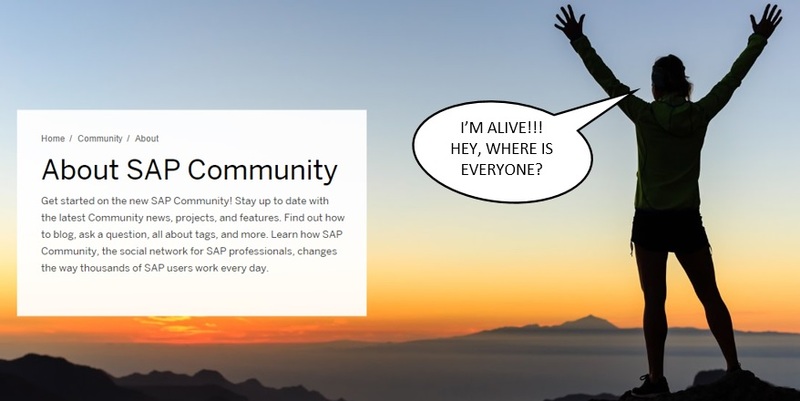 Of course, you can just search for anything there and then click “search SAP Community” but this direct link will save you a few clicks: https://onedx.find.sap.com/ (Shshsh, don’t tell anyone, it’s a secret!) Surprisingly, in that search you will find some filters that actually might be useful. Try using SCN search to find the most relevant post about HANA, for example. The result might surprise you. 10. I have something to say about this SCN 3.0, what do I do? If you have any ideas / suggestions for the functionality that should be available on SCN 3.0 (like something we’ve already had on SCN 2.0) then use Idea Place. Make sure to check the ideas already entered and avoid entering the same ones. Instead, upvote the existing ideas since there is 10 vote minimum just to get considered. Image source: SAP with “creative vandalism” by the author for the purposes of parody. My color wheel is preserved for all eternity! Great blog, as usual, Jelena. Still, I need to point out some “Weeeeeeell, not quite”s if you allow. It’s about reputation stuff. They can be found in the profile in the legacy reputation snapshot. They will not increase anymore, that’s true, though. Set in stone, so to speak. You can earn Karma credits, when others mark your content as valueable. The current count is visible in the Q&A area, but only to the user and moderators. Because where I fully agree with you is, when you were a point hunter on good old SCN, you definitly need a new hobby. Yes, that snapshot is done, it won’t change. But new missions are currently designed for this platform and you will earn shiny badges by mastering them. And those badges will be displayed on your reputation page in the profile. So… yeah. I think now I covered everything. Sorry to rain on your parade a bit. But I just wanted to share my little knowledge in this topic. There is only one positive thing about this new …….. SCN — I found you Jelena and your wonderful, insightful and delightfully funny blogs and comments. Jelena, I knew there was more than one reason to follow you. This is a great post! Many of the main workarounds necessary to keep us afloat in a sea of bugs are mentioned. I will admit that I have been somewhat snarky in my comments due to all the issues that have popped up. I am trying to be more positive, but it is tough after seeing suggestions from as far back as four months ignored. When I read your stuff, I get reenergized to keep pushing forward. Thank you for the encouragement! Cheers and keep up the positive attitude! 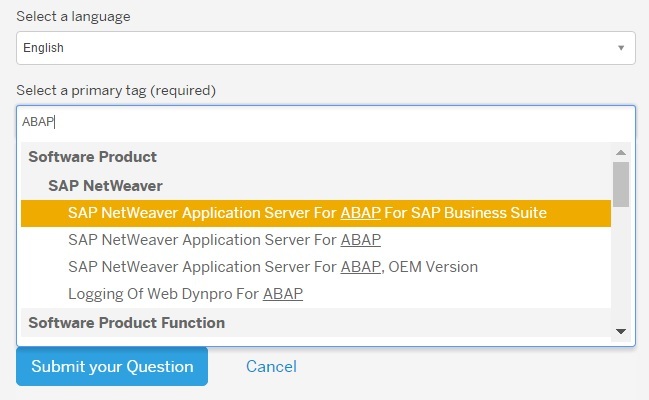 in your list of resources to find tags you might want to add my blog and the UI5 application I mention there to search for all available tags? 2. putting the ‘interesting to me’ tags on one page and checking it periodically is a good idea. here’s my, generously hosted by Microsoft mini-cloud, list. i wish i could share it, but it seems that i sometimes can’t. 4. https://onedx.find.sap.com doesn’t work on my Winphone, but that’s Microsoft’s fault. not sure whom to blame for identity issues there, though. i may have spent more than i wanted, but it’s surely not enough to pay for all the karma you have created with your blog post. Great overview and a good read. The fact that you can (must?) download an Excel file to view the tags is proof that it’s failed. Tags are fine to provide some additional metadata but they shouldn’t be used to provide structure. I guess just like death, taxes, and SAP upgrades, the SCN migrations are also inevitable. Loved the statement! I might have to quote you on that! This needs to be highlighted on the “Community” front page! @Steffi – yes, points and badges are still visible in the profile, but I see it as sort of a tombstone for the past reputation program. Perhaps “gone but not forgotten” would be more accurate. I wasn’t sure if there would be new missions, thanks for clarifying. @Helmut – that’s pretty cool, I added the link, thanks! @Michael – I’m glad you could find some positives in this blog (how did that get in there?!). I feel the long time SCN members have every reason to be frustrated with the way change management was handled (not!) in this migration. Yes, right now we just need to keep moving our feet but how far will it get us? @Gregory – I have my own hashtag?! Sweet! How do you check your own tag on SCN? I thought we were told there was no way to search for custom tags. Could you share your process? It would be helpful. @Matt Harding – notification list includes other items too, like moderator replies and “X is following you”. That’s why emails were very helpful as we could easily separate the actual replies/comments from the rest. Thanks for sharing though! After reading I had nothing to do, so I thought at least let me acknowledge “A thumbs Up”. Dont like this scn change at all.